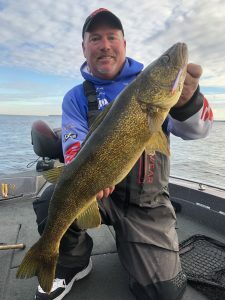 With the fall season upon us not only is this one of the best times of the season to catch numbers of trophy size smallmouth bass it is also a great time to catch those great big trophy size walleyes that Green bay is known for. Over the past couple of weeks we have been finding walleyes in water depths ranging from 25 to 35 feet of water and catching them using casting techniques near the bottom. Opportunities at catching these walleyes will continue well into November with a great chance at catching that trophy walleye.